Frank Ross, of Yell County, Arkansas, is gunned down in cold blood by Tom Chaney, a man that Frank Ross had assisted and provided with employment in his time of need. Mattie Ross, Frank Ross’s fourteen year-old daughter, is not prepared to allow her father’s death go unavenged, and enlists the help of U.S. Marshal Reuben ‘Rooster’ Cogburn in tracking her man down. Anyone who has seen the Coen brothers 2010 adaptation of Charles Portis’s novel, or Henry Hathaway’s earlier adaptation, will be familiar with the novel’s storyline: Mattie Ross, Cogburn, and Texas Ranger LaBoeuf set out across the Indian Territory to find Chaney (neither film’s plot differs much from that of the source novel). Rooster talked all night. I would doze off and wake up and he would still be talking. Some of his stories had too many people in them and were hard to follow but they helped to pass the hours and took my mind off the cold. I did not give credence to everything he said. He said he knew a woman in Sedalia, Missouri, who had stepped on a needle as a girl and nine years later the needle worked out of a thigh of her third child. He said it puzzled the doctors. Mattie Ross’s deadpan delivery does not work as well when dealing with the narrative’s dramatic elements. El T felt a little let down at the description of the shootout that ensues when Ned Pepper’s gang arrives at the dugout; perhaps it’s because we had seen the film already, but we weren’t completely wowed by the levels of tension. An enjoyable read, but not as good as the film. 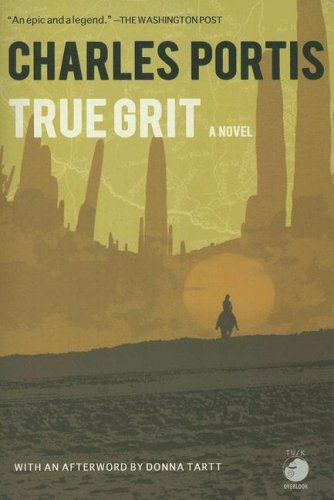 Buy True Grit on Amazon.